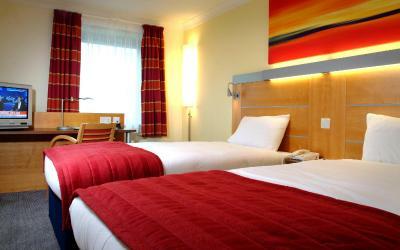 Lock in a great price for Holiday Inn Express London Golders Green – rated 8.1 by recent guests! Some of the staff were very friendly (Eastern European cleaning staff), others very unfriendly (reception lady South Korean / UK). The location is great. Expecting a cold business climate I was pleasantly surprised how welcoming the staff were. They were very friendly and pleasant. I would rate them all highly but would like to pick out Beverly for a special mention. She is fantastic. She helped make the stay a very enjoyable experience. I would recommend this hotel to anyone who needs to stay in the Golders Green area. Although the location and its boring surroundings are not something to brag about, the hotel itself was a very pleasant surprise as indicated in the check list: room, facilities, staff, breakfast, efficiency. The hotel is clean comfortable and the staff are friendly. The hotel has distinct advantages for the religiously observant traveler, as it is both opposite a synagogue and serves a kosher breakfast. I informed the hotel and booking.com in advance of my booking in time but when I arrived they asked for £50 to book in early I'm not impressed at this practice .On arrival we paid £10 each for a breakfast which was pathetic. There were a total of 3 items on the hot plate , beans, bacon and scrambled egg. Food was fine, people were pleasant. Room size was fine; didn't really matter as we were out all day. Bathroom size and shower were fine -- nothing exceptional. Location was fine for buses, but it was a LONG walk to the Underground. Took a bus to the Underground and back. Staff did secure a taxi for us to take to the airport so that was helpful. The room was clean and comfortable, there is parking on site which was included in my room rate. The staff within the hotel are amazing, they are helpful and friendly. Great location. Holiday Inn Express London Golders Green This rating is a reflection of how the property compares to the industry standard when it comes to price, facilities and services available. It's based on a self-evaluation by the property. Use this rating to help choose your stay! Holiday Inn Express Golders Green is a modern hotel located within a 5-minute drive from Finchley Central Tube Station and within 15 minutes from both the M1 and M25 Motorways. Private parking is available on site. All spacious rooms are light and contemporary, with en suite power showers, satellite TV and high speed internet access. A complimentary hot buffet and Continental breakfast is included. This Holiday Inn Express is within easy reach of Wembley Stadium and the Emirates Stadium. The local area offers a good range of restaurants, pubs and bars as well as the Brant Cross Shopping Center. There is also good access to Central London via the Norther Line. When would you like to stay at Holiday Inn Express London Golders Green? House Rules Holiday Inn Express London Golders Green takes special requests – add in the next step! Holiday Inn Express London Golders Green accepts these cards and reserves the right to temporarily hold an amount prior to arrival. Ventilation in room very noisy and couldn't sleep. Had to remove room card from socket to de-power the room and turn off ventilation overnight. This is not a good option, especially in summer. Reported issue to reception and they said they would tell maintenance. Hopefully this was just my room and not all rooms as it's a deal breaker. Range of meals in restaurant is very limited (although I enjoyed my meal). Better to walk into Finchley central and eat there. Breakfast good. Cooked option. Staff friendly and efficient. Very clean hotel including rooms. Nice decor. Beds comfortable. We went with 3 children, they gave us 2 rooms with no conection and the doors were a bit far away, it was a bit uncomfortable. Everything very nice and clean. The staff very friendly. Very comfortable for shabbat. There were kosher products in breakfast. Hotel is advertised as parking at hotel. Parking Bays where very tight this lead to cars taking up more then one space increasing the risk of cars getting damaged. Also there where spaces filled will hotel items or skips. This was mentioned to staff at reception as I had to squeeze my car into a tiny gap. Luckily I have a company car but I would seriously not use this hotel if I was taking my own personal car for the risk of damage. I would rather have paid for a separate car park that had decent parking. Staff where very friendly but seemed like they needed some training on standards. For example, when I was ordering drinks staff wasn't too sure on their drinks offering. Secondly I ordered a jacket potato with cheese & beans this came with a side salad. The potato had taken at least 20 min to arrive there was only one other family eating a the time. The potato was luke warm & I wasn't given any quality check to see if I was enjoying my food. With this being a buinsess trip I had been at work all day & wasn't in a position to wait another 20 mins for another jacket potato to me made. The personnel are really helpful and friendly. The hotel is not in the centre of London but there is a bus stop right outside which takes you into Marble Arch or Victoria in about 30 minutes, so it's not inconvenient. This hotel was a pleasant surprise - I expected a crowded hotel with poor parking and this was the opposite - for a hotel on the North Circular close to the Northern Line it's great. All brilliant, but was disappointed that there was no safe in the room. Shower pressure weak. I put in a special request for an early check in since we were going to travel overnight and arrive at the hotel early in morning. I received an email and phone call from the hotel that they will try their best. When we arrived, the demanded £50 for extra for early checking which wasn't mentioned in any of their communications. After 3 hours wait we were given a room earlier than 12noon after I phoned booking.com. Their manager was very unhelpful and rude. Great location, easy to find! Gives as nice feel with the blue lights in the bathroom. Bed and pillows very comfy! The rooms were rather dated and need renovation. There was only on chair on the (double) rooms, and no chair to relax. Breakfast and dinner facillities were ok, enough parking space, en easy by public transport to London center. One rude and unpleasant South Korean / UK lady at reception and the fact that the food was all microwave cooked ready meals. The room that was booked for three persons had to be changed after one night. The shower gel Dispenser was broken and was lying on the floor. The electricity kept turning off for no reason even though the room card was correctly inserted. The shower head didn’t fit onto the holder so it had to be held in the hand of all three occupants whilst they tried to get ready on the Saturday night and Sunday morning. The hotel did Chang e the room when informed of these issue son Sunday morning. Food (apart from the breakfast) and draft beer was awful. The friendliness of the staff there.